These opening words each Sunday remind us of our highest common calling – to know, to name, to honor each other as our full selves. These words call us to be authentic, and to honor the authenticity of others. Being a welcoming and inclusive community means consciously working to find ways to name, honor, and value experiences and identities that are usually minimized or devalued. It means uncovering our unconscious assumptions about what’s “normal” and who is present in our community, and opening ourselves to the possibility of greater diversity. In order for us each to feel welcome and included in faith communities, we need to see ourselves reflected and present in some way. Pronouns are a powerful form of agency for individuals defining their own identity. Gender identity is a fluid and open process for many, and some feel that traditional pronoun use doesn’t fit with their own gender identities. Transgender, genderqueer, and other gender-variant people may choose different pronouns for themselves than those in traditional use. 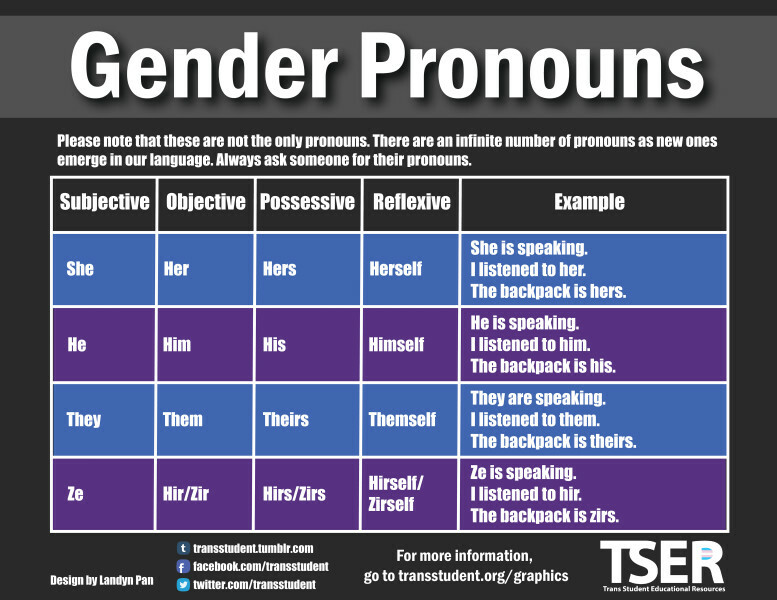 By naming our own pronouns with intention, we become more mindful of gender identity diversity and openness. The following is a chart of common pronouns used, knowing that these take many forms from person to person, and can change. Introduce yourself using your name and pronouns. Use pronouns as a common “introduction/check-in” practice in smaller groups. Use someone’s name in place of pronouns more often. Ask others how they would like to be referred to. If you make a mistake, simply correct yourself or offer a quick apology, showing respect and care. Be mindful, but try not to focus on, pronouns. Some may not prefer much, or any, attention to their pronouns. Be gentle with yourself, and with others. Remind others gently about your pronouns, and begin in a place of grace, respect, and honoring of each other. It is okay to make mistakes, to admit mistakes, and try to be more careful and mindful going forward.